A simply must-have current import CD title by the Acid Mothers Temple. In some ways, this title sort of reminds me of their Have You Seen the Other Side of the Sky disc (’06). One reason is obvious – because both CD’s have at least five actual songs, not like (a lot of the) typical Acid Mothers CD’s – as a lot of their music have (just) two tracks per disc. Each cut here fully serves its purpose. The opener – the twelve-minute Chinese Flying Saucer appears to be the AMT’s own personal tribute to Led Zeppelin. Chakra 24 and Back Door Man Of Ghost Rails Inn are more like one’s own personal soundtrack to a most memorable acid trip – nice sitar playing – and it’s nice to hear vocals all the way through an Acid Mothers Temple cut, especially when that song’s duration clocks in at fifteen minutes. Then there’s Shine on You Crazy Dynamite that’s like your semi-typical AMT mayhem with perhaps a touch of Pink Floyd influence in there somewhere, and the total freakout, mind-scrambling epic – the nineteen-minute Electric Death Mantra. Saw on the label blog that AMT these days has a stable as well as lasting four-piece line-up – both in the studio and on tour. Personnel: Kawabata Makoto – guitar, Higashi Hiroshi – keyboards & guitar, Tsuyama Atsushi – bass, flute & vocals and Shimura Koji – drums. 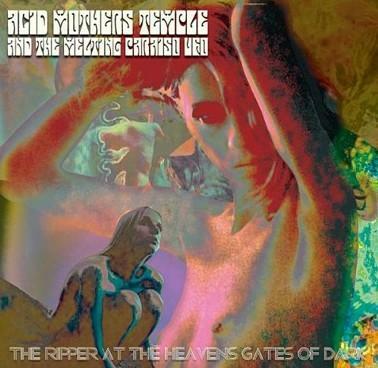 The overall sound, feel and vibe of The Ripper At The Heaven’s Gates Of Dark clearly achieves the excellence that Acid Mothers Temple has been known for at least fifteen years now. AMT’S work here is in no way a rip-off of psychedelia, acid rock (as some of the squares that I once knew called it) or trip rock of the ’60’s or ’70’s – but an extension of such. CD is a limited edition of 1,500 copies + the 2-lp vinyl is one of 500 copies. Definitely worth many repeated plays. Quite possibly the best Acid Mothers Temple CD I’ve heard in a while now.